With a possible two billion Earth-like planets in our galaxy alone, the chances of extraterrestrial life are looking better and better. What will these creatures, shaped by another world, look like? It’s up to science fiction creators to imagine them. But how can you create an alien life form that’s really different than anything you’ll find on Earth, rather than just a slightly tweaked version of a human or other Earth creature? We talked to xenobiologists, and did extensive research, to create a step-by-step guide to creating a truly alien life form from the ground up. Don’t create life without reading this handy guide! Carbon is an excellent basis for life, since it forms stable chains with an all-carbon backbone, something no one other known element can claim to do. It’s also the perfect foundation on which to construct more complex molecules, since it contains four unpaired electrons that can create as many stable yet easily broken covalent bonds with other elements. Since older stars naturally produce carbon, along with nitrogen and oxygen, there seems to be a great abundance of it in the universe. Even among scientists who study this stuff for a living, there seems to be great disagreement about whether alien life would be carbon-based. NASA astrobiologist Lynn Rothschild says “Definitely carbon-based,” when asked about alien life. And Seth Shostak, senior astrobiologist at SETI, says carbon is “most likely the biological prerequisite” for life. Silicon is right below carbon in the periodic table and it can form some chains, but it bonds too strongly to oxygen and basically forms rock. I think life would be carbon-based, and I’m gong to assume it requires liquid water, or something very close to liquid water. An ammonia/water mixture might work. Another objection to silicon-based life: silicon’s bonds are too reactive to be stable for very long, says NASA astrobiologist Michael New. 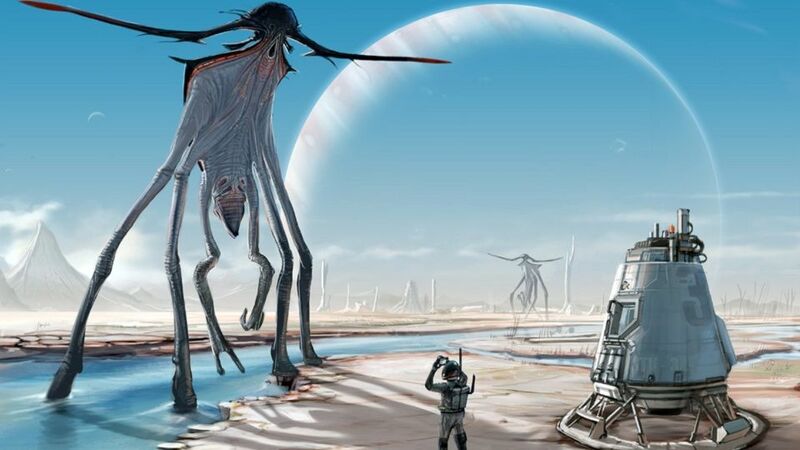 Aliens from a water world like ours would probably be carbon based. But hotter planets could in principle have silicon based life. They would definitely have a more crystalline and rock like appearance, but they would still have to be dexterous. But there are many other possibilities, such as giant sentient balloons floating in gas giants, or intelligent plasma clouds flying through space. He praises some of Star Trek‘s creatures, particularly the space amoeba the Enterprise flies into in one episode — which is a neat concept, even if the execution is lacking. Of course, it may be quite possible that alien life would be composed of strange new elements, unknown to modern science and unbound by the constraints of DNA, RNA and amino acids. New points out that even within the constraints of carbon-based life, though, there could be a wide variety of biochemistries and life cycles. Even here on Earth, you can look at prokaryotes, fungi and protists, for a “proof of concept” of how radically different life could work. Back in 2007, the National Research Council put out a report called “Weird Life” that explored some of the very different ways that biology elsewhere could be very different than on Earth, even if it were carbon-based. What environment did it evolve in? All life, whether on Earth or a planet in another galaxy, evolves in response to its environment. Without understanding the environment that the creature evolved in, you’ll never be able to create a plausible form of life. So for example, Bullock says you should consider the gravity on your alien world: A high-gravity world will produce short, squat creatures, while a small moon will produce tall thin ones. And an Earth-like world is unlikely to produce life forms much larger than the Pentagon, says Shostak. Could intelligent creatures evolve in space? New says probably not, due to the radiation environment. And Kasting says intelligent life probably can’t even get a foothold, except on a planet with a solid or liquid surface “that maintains stable pressure temperatures and conditions.” Especially if your story requires life that can build a spaceship, or a communications device, you probably want an Earth-like planet, probably on land. How does your creature eat? All life needs energy, and this energy must be produced in a way that the life form can easily convert. Here on Earth, the ultimate source of all energy is the sun. It provides energy in the form of both light and heat, which is converted by plants into food and consequently energy. All life on Earth gains its energy from the successive chain of consumption: sun → herbivores → omnivores → carnivores. Each step in this chain involves a net loss of approximately 90% the previous total energy, meaning there is an overall loss of biomass the further along the chain you manage. (So there are more plants than giraffes, and more giraffes than lions). Its probably safe to assume this would hold elsewhere, so if you are creating a producer-type creature, there would be more of them than the carnivores that eat them. Likewise, a sudden decrease in one species or type would impact all life down the chain. This isn’t to say all energy must come from a star – theoretical alternatives run the gamut from thermal and pressure gradients to electrical or chemical fields. Like Earth’s power source, each of these sources has their own pros and cons, but are all highly theoretical. So how does your alien consume “food” and create energy? Really, it just depends on the ecosystem you create for its homeworld, says New. Even if you never show that ecosystem, you should be aware of how it functions so your alien can function as part of it. And really, you should choose whatever makes the best story. Reproduction can, as we see on Earth, be either sexual or asexual, depending on the needs of the creature. Some organisms can actually do both, depending upon circumstance. Some types of plankton, for example, reproduce asexually when competition is low, and switch over to sexual reproduction once their population is large enough. This is called heterogamy. Also, some “distressed, dispersed reptile communities” can reproduce by parthenogenesis, notes Bullock. individual fungus from accidentally mating with itself. It’s possible aliens may have their own mating types. As with everything else, how your alien reproduces depends on the environment of its homeworld — but most experts seem to believe sexual reproduction of some sort will be common elsewhere. The main stumbling block for asexual reproduction is that it doesn’t create the same amount of genetic diversity as sexual reproduction does, Kasting points out. Chromodynamic/Nuclear Life – These life forms might evolve in conditions where the nuclear (strong) force dominates. The reason this force does not play a greater role in our own lives, beyond holding our atoms together, is that while it is very strong, it is only effective within ranges of 10-15 meters or so (not very far). These sorts of conditions, though, might be found in certain celestial environments – particularly within neutron stars, which are super dense, and home to seas and mantles of super-hot swirling neutrons. It’s been theorized that these neutrons may provide a sort of ‘primordial soup’ for a kind of life we can only imagine. Weak Life – “Weak force” life forms are hard to imagine, as the weak force itself doesn’t seem to do a whole lot, and they don’t hold anything together. Theoretically, though, a weak life form might survive via manipulation of its surroundings, if it could affect the decay or influence these processes and gain energy via the resulting imbalance. Gravity Life – Gravity is an extremely efficient energy source, and is everywhere, which makes gravity-based life seem a bit more likely. Small organisms might harvest energy much the way we do, converting gravitational energy from winds, waterfalls, and currents. Larger organisms (much larger) might utilize the immense gravitational energies in black holes, or interstellar collisions. The main problem with trying to imagine an utterly new alien species is that, as early 21st century humans, we have only the example of Earth species to follow from. Our planet, currently and over its entire history, has held a staggeringly diverse playing field of plants and animals, from single-celled globules to narwhals, giraffe weevils and pink fairy armadillos, so it’s common to envision alien life as being some sort of patchwork of preexisting species. Even the great H.P Lovecraft’s beloved, unthinkable horrors are commonly depicted as hybrids of six or seven species of arthropod with a squid thrown in. However, even taking parallel evolution into account, alien life almost certainly would not look similar to Earth life. Because the catalysts for natural selection are random, dominated by the conditions of their home world (changes in weather, terrain type, etc.) and random mutations in creatures, life on an alien planet would be almost by definition, impossible to predict. Much of life on Earth is limited in size and shape based on biomechanics. The physics and energy involved in transferring not only energy, but bodily fluids as well, become complicated fast — it took a while for scientists to figure out why giraffes don’t pass out after taking a drink of water. More critically, cellular biology puts constraints on the size and shape of cells themselves, as you still need to fit all the components of a single cell inside itself no matter its purpose. Along with biomechanics, energy sources also constrain the size of life forms. An organism with abundant energy and a food surplus will be more capable of growing to whatever size may be best determined by other environmental factors. If there are fewer calories to be had, though, an organism can only grow to a certain size. Hands, or hand-like appendages are also very convenient for the use of tools and manipulating objects and our surroundings. An ‘intelligent’ life form advanced enough to travel across galaxies will almost certainly have some sort of hand-like appendages. What senses will your creature have? All organisms have some sort of sensory input — but they may not have a set that matches our own. An alien may have fewer senses, or even more than our traditional five. It would largely depend on what their environment required. The sense of touch is probably certain, but it’s possible not all life forms would need to hear or smell. Lacking a particular sense might be an advantage in some environments, or simply be useless (as in blind cave dwelling animals, etc.). If a creature could communicate telepathically, speech and hearing may not be as important. Even if an alien has eyes, however, its visible wavelength may be very different from ours. Perhaps it can see microwaves, infrared light, or hear sound waves far above or below our own auditory range. This same idea can be put towards taste and smell. Other senses or abilities are certainly possible, but, like our own, would have to be a product of the alien’s environment, providing an advantage to the survival of the species. Maybe there is a planet where synesthesia is actually great to have? Life is much stranger, and more wonderful, than we humans can understand right now. If you can imagine a planet with a very different environment — different gravity, different atmosphere, different food sources — then you’ll naturally come up with a strange and beautiful creature, such as could never have come into existence on Earth. The only thing that’s absolutely not plausible is that creatures from other worlds would look just like us. And like NASA’s Michael New says, the most important thing to do is just to tell a really cool story.